1. In 2012, a fairy tale of Hans Christian Andersen was found. It is believed to be his very first story, written as a teen. The six page story tells about a dirty candle that isn't used until a tinder box sees its inner value and lights the dirty candle's wick. 2. Charles Dickens and Hans Christian Andersen met and Andersen visited Dickens at his home. It would be the end of a friendship when Andersen overstayed his welcome. Dickens wrote, "Hans [Christian] Andersen slept in this room for five weeks – which seemed to the family AGES!" 3. Hans Christian Andersen may have had dyslexia making reading and writing very difficult for him. 4. One of the first stories Hans Christian Andersen remembers his dad reading to him was The Arabian Nights. 5. The fairy tale writers, the Grimm Brothers(Jacob and Wilhelm), became friends with Hans Christian Anderson. 6. The stories of Hans Christian Andersen were translated from his native Danish into 150 languages. 7. The Hans Christian Andersen Fairy Tale Theme Park opened in Shanghai, China, in 2017. 8. Some of the popular fairytales of Hans Christian Andersen include: The Emperor's New Clothes, Thumbelina, The Little Mermaid, The Ugly Ducking and The Princess and the Pea. 9. You can see a statue honoring Hans Christian Andersen in Central Park, New York City. 10. April 2nd, the birthday of Hans Christian Andersen is International Children's Book Day. 11. Unlike many famous people, Andersen was recognized during his lifetime for his amazing storytelling! 1. Which fairy tale of Hans Christian Andersen to you like the best and why? 2. Write TWO facts about the country of Denmark. 3. 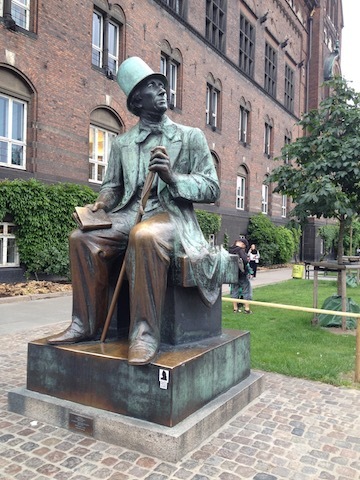 Look at the statue of Hans Christian Andersen found in Copenhagen, Denmark. Write a paragraph pretending to be the statue. What do you see? What do you hear? What are you thinking? 4. What is your definition of bullying? Have you ever been bullied? Have you ever do something which someone else might think is bullying? If you see someone being bullied, what could you do? Perhaps, you might find this fun and informative play on Hans Christian Andersen of interest. The information play is based on the Mark Goodson Production To Tell the Truth Game Show. To Tell the Truth was a popular television show which has returned with host Anthony Anderson(of Blackish). Three guests all claim to be the real guest being interviewed by a panel. The real guest must tell the truth where the other imposters do not have to do so. Kids must be "truth detectives" to determine just who is the REAL Hans Christian Andersen. Students in grades 4 and up will have fun acting out their parts and learning some interesting facts about fairy tale writer, Hans Christian Andersen. 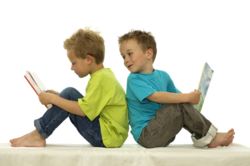 Comprehension questions, discussion questions, extension activities and resources are included. It is said that Hans Christian Andersen based his story, The Ugly Ducking, on his own life and the bullying he experienced. Hans was often teased as a boy. He was very tall and skinny. He was called "scarecrow" by neighborhood children. One day, he actually climbed a tree to get away from bullies who were chasing him! Once in the tree however, he got tangled and stuck. Hans' dad had to come get him down.